Ten years ago, for the very first Doodle 4 Google contest, we asked students “what if?” A decade later, we’ve been privileged to receive hundreds of thousands of submissions for our annual contest—submissions that reflect the dreams, hopes, and talents of students across the country. These young artists help us to see the world through their eyes and find inspiration in unexpected places. This year was no exception. We asked students to respond to the theme “What Inspires Me…” and received doodles depicting everything from a love of family and food to a passion for intergalactic roller coasters (!). Now we’re thrilled to announce the winner of the 2018 Doodle 4 Google contest: first-grader Sarah Gomez-Lane, who drew delightful dinosaurs to highlight her dream of becoming a paleontologist. Sarah was our K-3 finalist and the Virginia state winner. We fell in love with Sarah’s rendering of her dinos and were blown away by her big (you might even say “dino-sized”!) ambitions for her future, especially at her young age. 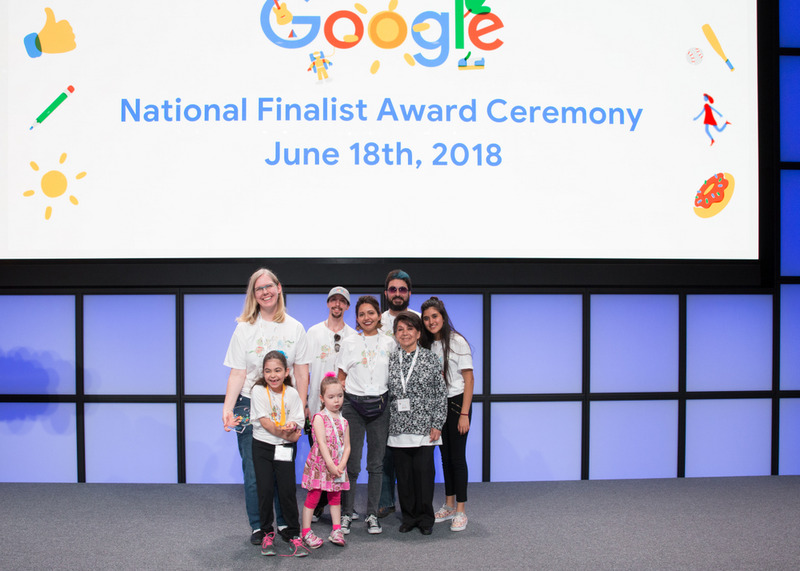 Sarah, first on the left in front, at the Doodle 4 Google award ceremony at Google’s headquarters June 18. For the first time in Doodle 4 Google’s 10-year history, the National Winner will have the opportunity to turn their submission into an animated, interactive Doodle featured on the Google homepage. Over the summer, Sarah will collaborate with the Doodle team to bring her artwork to life. She’ll also receive $30,000 toward a college scholarship, and her elementary school in Falls Church, VA, will receive $50,000 to spend on technology to help students like Sarah continue to pursue what inspires them. Thank you to everyone who participated not only this year but throughout the past decade. And, of course, a huge congratulations to all of the talented 2018 winners. From all of us at Google: keep dreaming—and keep doodling!